Andrew Jackson Holcombe was born in 1840 at NY. He was the son of Imri Holcombe and Elizabeth J. Miller. 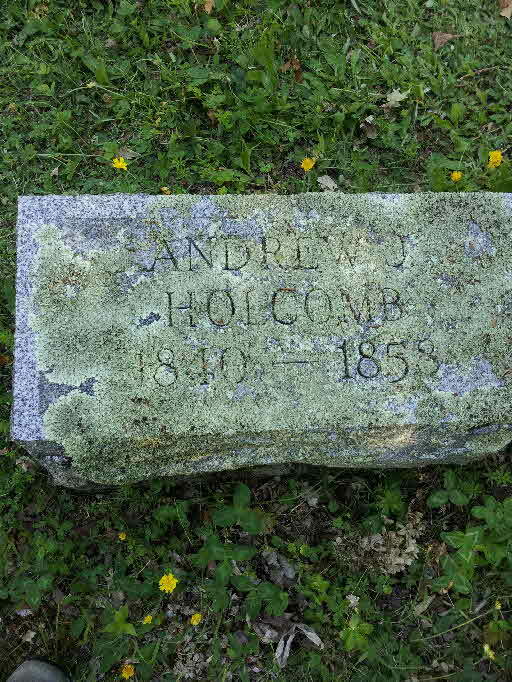 Andrew Jackson Holcombe died in 1858. He was buried at New Ohio Cemetery, North Colesville, Broome Co., NY. Louisa P. Holcombe was born in 1844 at NY.1 She was the daughter of Imri Holcombe and Elizabeth J. Miller. Louisa P. Holcombe married Wix Amisa Watrous, son of Loomis L. Watrous and Lucy Terrill, in 1865. Louisa P. Holcombe died in 1927 at NY. 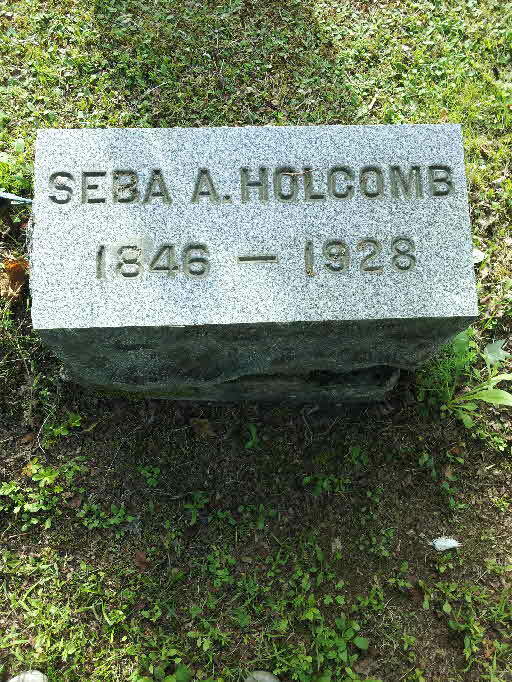 Seba A. Holcombe was born on 14 April 1846 at NY. He was the son of Imri Holcombe and Elizabeth J. Miller. Seba A. Holcombe married Flora E. Watrous circa 1871.1 Seba A. Holcombe died in 1928. He was buried at New Ohio Cemetery, North Colesville, Broome Co., NY. Seba and Flora were enumerated in the 1880 Fenton, Broome Co., NY, federal census in the household of her parents. He was a stone mason age 31, she was 26. Seba and Flora were again enumerated in the 1900 Fenton federal census. They were childless. Sophronia Frank was born in 1826. She married Imri Holcombe, son of Nathaniel Holcombe VII and Thankful Holcombe. Sophronia Frank died in 1904. 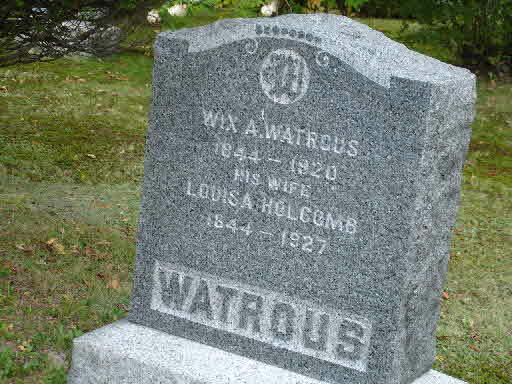 She was buried at New Ohio Cemetery, North Colesville, Broome Co., NY. Eldorado Holcombe was born in 1857 at NY. He was the son of Imri Holcombe and Sophronia Frank. Frank W. and Hannah were enumerated in the 1900 Colesville, Broome Co., NY, federal census. He was a farmer age 41, she was 43. They had been married 22 years and had 3 children, all living. Children in the household were Willie 18, Letitia 10, and Marguerita 10 months. Frank Willis Holcomb, 82 years old, died at 8:30 o'clock Saturday night at his home, 59 Bigelow street. He is survived by two daughters, Mrs. Leigh Yeager of Harpursville and Mrs. A. MacFarlane of Binghamton; a granddaughter, Lorena Margaret MacFarlane of Binghamton and several nieces and nephews. The body was removed to the William R. Chase Funeral Home, 44 Exchange street. The funeral of Frank W. Holcomb was held Tuesday afternoon at 2 o'clock at the William R. Chase funeral home, 44 Exchange street. The Rev. Leon Boughton officiated. The pallbearers were Elmer Bullis, Clarence Cadwell, Claude Miller, Edward Hare, Archie Benedict, Raymond Miller, Donald Alford and Vere Holcomb. Burial was in New Ohio cemetery [Colesville, Broome Co., NY]. [S807] Find A Grave, online http://www.findagrave.com, Find A Grave, database and images (https://www.findagrave.com : accessed 12 November 2018), memorial page for Frank W. Holcomb (1868–1940), Find A Grave Memorial no. 76104162, citing New Ohio Cemetery, Belden, Broome County, New York, USA ; Maintained by Colesville Neighbor (contributor 47601677) . 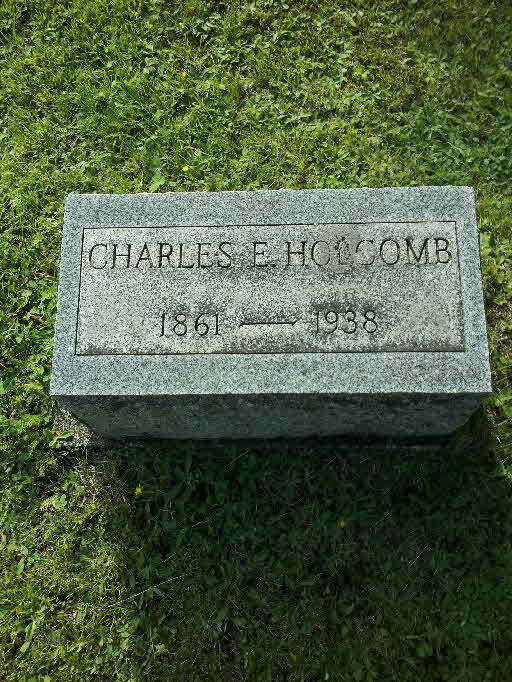 Charles E. Holcombe was born in May 1861 at NY. He was the son of Imri Holcombe and Sophronia Frank. Charles E. Holcombe married Elmina L. Way. Charles E. and Minnie L. were enumerated in the 1900 Colesville, Broom Co., NY, federal census. He was a farmer, age 39, she was 37. Children in the household were Hazel 9, and Leola 5. Also in the household was mother Saphronia 73. Frederick Holcombe was born in 1865 at NY. He was the son of Imri Holcombe and Sophronia Frank. Burton A. Holcombe was born on 20 June 1867 at NY. He was the son of Imri Holcombe and Sophronia Frank. 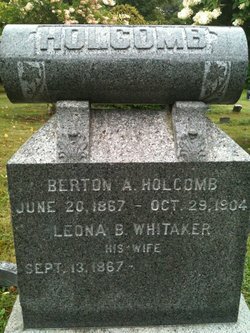 Burton A. Holcombe married Leona B. Whitaker. Burton A. Holcombe died on 29 October 1909 at age 42. Almira Howe married Cyprian Holcombe, son of Adonijah Holcombe and Charity Gillett, on 24 October 1822 at Simsbury, Hartford Co., CT.1 Almira Howe was buried at New Ohio Cemetery, North Colesville, Broome Co., NY. Almira Holcombe was born circa 1830 at NY.1 She was the daughter of Cyprian Holcombe and Almira Howe. Elmira Holcombe was born circa 1834 at NY.1 She was the daughter of Cyprian Holcombe and Almira Howe. Victnew Holcombe was also known as Vietnew Holcombe. He was born circa 1841 at NY.1,2 He was the son of Cyprian Holcombe and Almira Howe. Victnew Holcombe married Sarah Mulford. Victnew Holcombe died after 1 January 1920. Victnery and Sarah were enumerated in the 1875 Colesville, Broome Co., NY, state census. He was a farmer age 33, she was 30. Children in the household were Charles H. 6, Lewis 4, Grace 3 years 2 months, and Fanny 2 years 1 month. Vietnew and Sarah were enumerated in the 1880 Fenton, Broom Co., NY, federal census. He was a farmer age 39, she was 35. Children in the household were Charles 12, Lewis 9, Grace 8, and Fanny 7. Thomas is recorded as a master farmer in the 1850 and 1860 censuses of Fremont, Lower Sandusky Co., Ohio, where he had lived since 1822. Either Thomas or his son, Thomas Jay, was living in Sandusky Co., Ohio, Oct 20, 1865 when "Thomas Holcomb" witnessed application for pension of Mrs. Homer Grant P. (Eliza M. Philo) Holcomb, widow of deceased Union soldier. [S25] Hannah McPherson, Holcombe Genealogy, Page 104.2/Item A-8-1-1-2-8-1. Newell served as a soldier in the War of 1812. Newell Holcombe was the son of Zaccheus Holcombe and Sarah Bettis. [S25] Hannah McPherson, Holcombe Genealogy, Page 104.2/Item A-8-1-1-2-8-2. Homer Holcombe was the son of Zaccheus Holcombe and Sarah Bettis. Clarissa Holcombe was the daughter of Zaccheus Holcombe and Sarah Bettis. Lurean and Thaddeus were living at Mechanicsville, Ashtabula Co., OH, as late as 1880-1882. Lurena Holcombe was the daughter of Zaccheus Holcombe and Sarah Bettis. 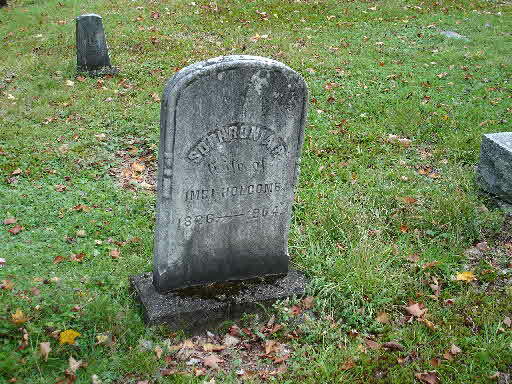 Lurena Holcombe lived in 1880 at Mechanicsville, Ashtabula Co., OH. [S25] Hannah McPherson, Holcombe Genealogy, Page 105.1/Item A-8-1-1-2-8-5. Agnes was the daughter of a French immigrant who fought for America in the war of 1812 and died of yellow fever. Agnes LaForce married Thomas Holcombe, son of Zaccheus Holcombe and Sarah Bettis. Lucia Laurena Holcombe was born on 7 May 1829. She was the daughter of Thomas Holcombe and Agnes LaForce. Lucia Laurena Holcombe lived in 1891 at Clyde, Sandusky Co., OH. Edwin is recorded in the 1860 census of Fremont, Sandusky Co., OH, as a master farmer. He was a Union soldier who died in the service, Washington, DC, July 186_. 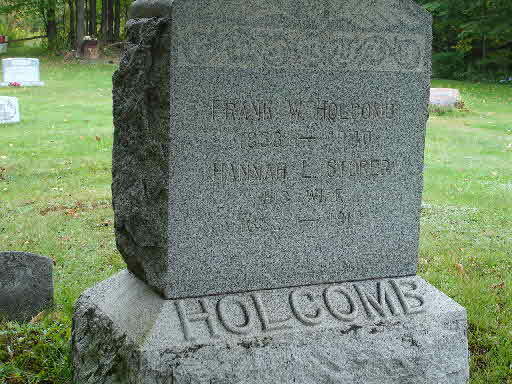 Edwin R. Holcombe was born in 1831. He was the son of Thomas Holcombe and Agnes LaForce. [S25] Hannah McPherson, Holcombe Genealogy, Page 104.2/Item A-8-1-1-2-8-1-2. Mary C. Holcombe was born on 19 March 1838. She was the daughter of Thomas Holcombe and Agnes LaForce. Unknown Holcombe was born in May 1835. She was the daughter of Thomas Holcombe and Agnes LaForce. Homer Grant P. Holcombe was born on 1 May 1837. He was the son of Thomas Holcombe and Agnes LaForce. Homer Grant P. Holcombe married Eliza M. Philo on 13 January 1861 at Ottawa Co., OH.2 Homer Grant P. Holcombe died on 31 May 1864 at typhoid-pneumonia fever, Ft. Ethan Allen, VA, at age 27. Homer, who lived in Riley Twp., Sandusky Co., OH, enlisted at Fremont, OH, as a private on May 2, 1864 for 100 days in Co. G., 169th Ohio Volunteer Infantry Regiment National Guards; mustered at Camp Cleveland, OH, May 15, 1864. He died after a two week illness in the hospital at Ft. Ethan Allen near Washington, DC. [S25] Hannah McPherson, Holcombe Genealogy, Page 104.2/Item A-8-1-1-2-8-1-5. Clarissa A. Holcombe was born on 19 February 1840. She was the daughter of Thomas Holcombe and Agnes LaForce. Recorded in the 1860 census of Fremont, Sandusky Co., OH as a farmer living in the home of his parents there. He was a Union soldier who died at home. Allen E. Holcombe was born on 20 October 1843. He was the son of Thomas Holcombe and Agnes LaForce. Allen E. Holcombe died on 24 October 1865 at Riley Twp., Sandusky Co., OH, at age 22. [S25] Hannah McPherson, Holcombe Genealogy, Page 104.2/Item A-8-1-1-2-8-1-8. Thomas served 18 months as a Union soldier. Thomas Jay Holcombe was born on 18 August 1846. He was the son of Thomas Holcombe and Agnes LaForce. Thomas Jay Holcombe lived on 7 January 1891 at Fremont, Sandusky Co., OH. He died in 1894 at Sandusky Co., OH. [S25] Hannah McPherson, Holcombe Genealogy, Page 104.2/Item A-8-1-1-2-8-1-9. Louisa (?) was born in 1817 at VT. She married Thomas Holcombe, son of Zaccheus Holcombe and Sarah Bettis. Eliza M. Philo was born on 26 December 1844 at near Bellevue, Sandusky Co., OH. She married Homer Grant P. Holcombe, son of Thomas Holcombe and Agnes LaForce, on 13 January 1861 at Ottawa Co., OH.1 Eliza M. Philo died on 14 January 1934 at 535 Rice St., Fremont, OH, at age 89. She was buried at Oakwood Cemetery, Fremont, OH. Allen W. Holcombe was born on 27 February 1862 at Riley Twp., Sandusky Co., OH. He was the son of Homer Grant P. Holcombe and Eliza M. Philo. Allen W. Holcombe lived in 1934 at 418 N. 5th Street, Fremont, OH. Allen W. was enumerated in the 1920 Fremont, Sandusky Co., OH, federal census, page 7B. He was a laborer age 56. His widowed mother Eliza, age 75, was living with him. [S25] Hannah McPherson, Holcombe Genealogy, Page 104.2/Item A-8-1-1-2-8-1-5-1. Ella had died before her mother and probably lived with her most of her life. Ella Holcombe was born on 16 August 1863 at Riley Twp., Sandusky Co., OH. She was the daughter of Homer Grant P. Holcombe and Eliza M. Philo. Charles Holcombe was born on 6 May 1868. He was the son of Thomas Jay Holcombe and Alice Langel. Edna Holcombe was born on 3 August 1877. He was the son of Thomas Jay Holcombe and Alice Langel. Earle Holcombe was born on 5 May 1880. He was the son of Thomas Jay Holcombe and Alice Langel. [S25] Hannah McPherson, Holcombe Genealogy, Pages 98.2-99.1/Item A-6-7-5-4-1. [S25] Hannah McPherson, Holcombe Genealogy, page 98.2. David is recorded in the 1850 census of Windsor, Hartford Co., CT , as a farmer, living in the home of Eli Phelps. McPherson does not mention any family, but Bowman lists wife Priscilla. David Holcombe was born at Windsor, Hartford Co., CT. He was the son of Joseph Holcombe III and Olive Marshall. David Holcombe died on 14 December 1866. [S25] Hannah McPherson, Holcombe Genealogy, Page 99.1/Item A-6-7-5-4-2. [S65] Deanna Holcomb Bowman Thomas Holcomb, Vol. I:Pg. 150/Item 67631. Dryden Holcombe married Rosanna Adams, daughter of Richard Adams Jr. and Miriam Case. Dryden Holcombe was born at Windsor, Hartford Co., CT. He was the son of Joseph Holcombe III and Olive Marshall. 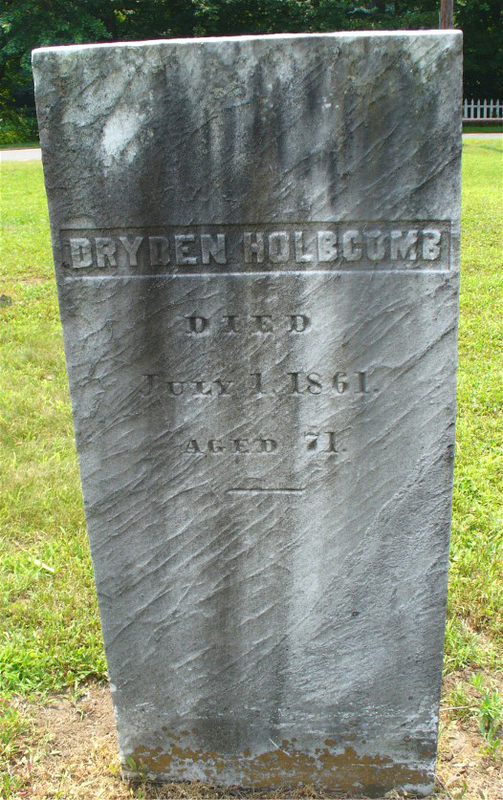 Dryden Holcombe died on 1 July 1861. He was buried at Elm Grove Cemetery, Poquonock, Hartford Co., CT.
Dryden was a Sgt. in the War of 1812 in a Co. of 3rd Regt. CT Artillery, commanded by Capt. J. H. Boyles and Col. Macomb, having enlisted at Hartford, CT, May 27, 1812, and served 18 months, for which service he later received US bounty Land grant of 160 acres. He is recorded in the 1850 census of Windsor, CT as a joiner. McPherson cross references to A-8-1-6-5-1-4, a Dryden who moved from Granby to Cortland, Trumbull Co., OH about 1848. McPherson has this Dryden marrying Maria Griswold, where Bowman shows Dryden, son of Joseph marrying both of them. [S25] Hannah McPherson, Holcombe Genealogy, Page 99.1/Item A-6-7-5-4-3. [S65] Deanna Holcomb Bowman Thomas Holcomb, Vol. I:Pg. 150/Item 67632.